The Gator Fillet knife from Gerber makes it easy to clean, gut and fillet fish. 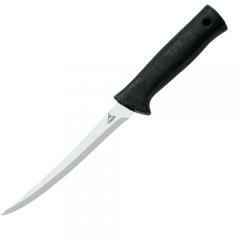 Its full-tang blade is made from high quality steel with a fine edge, making it both durable and razor sharp. The slim profile also gives it a sharp, controllable piercing point for precise work, as well as the flex that it needs for filleting medium to large fish. The patented Gator Grip handle is designed to provide a secure grip even with wet hands. It combines a solid glass-filled nylon core with a soft Santoprene rubber overlay, making it comfortable to hold and preventing slippage. The knife comes with its own custom-molded plastic sheath, which has a built-in ceramic sharpener for field maintenance.